Friday, after work, it was a trip up to Beaver PA. Some friends of mine do an improv show there – and were going to be short handed as a bunch of the regular troupe members were doing a show in DC. So me and a bunch of Pittsburgh folks made the drive up to help out. Got to the venue about an hour or so early, at the tail end of sunset. Broke out an SB800 and an umbrella to shoot that top pick of Robin. I’ve also been trying to shoot a little more bare flash lately. I haven’t quite gotten to the point where I like the results… but I think I’m getting a little closer. Saturday was (thankfully) a day I could sleep in… because I knew in advance it was going to be one of those forever days. At 2 pm it was off to campus to shoot the Orientation of our summer Pre-Collage program. Nothing fancy, mind you. A meet & greet type of event. I’ll spare you the vast array of uninterestingness. Three hours later I’m out the door to the second event, the penultimate home game for the Pittsburgh Power. Actually, I shouldn’t say that. There is a good chance the Power (or, Pah’errrr if your local) will make it to the playoffs. The fact that they are in contention led to – what turned out to be – a ridiculously exciting game. It was a must win to keep their playoff hopes alive, and a back & fourth struggle for most of the game. Behind on the scoreboard and with only 14 seconds left, the home team gave up the ball – causing a lot of the fans to get up and leave the arena. All the Visitors had to do was snap it twice to lock in the win. But wait! Fumble!! Recovery!! Seven seconds and dreams are being dreamt. With one second left on the clock the ball is snapped, the QB almost sacked, but an end zone completion is made – tying the game. With no time left in regulation the kicker (who had missed something like 4 out of his last 5 attempts) successfully kicks the extra point for the win. I don’t care who you are, that’s some fairly exciting stuff. 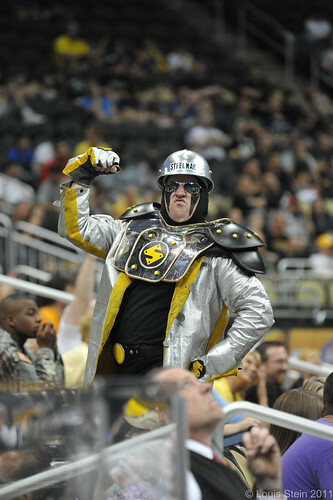 Pittsburgh sports fans - you just gotta love 'em. 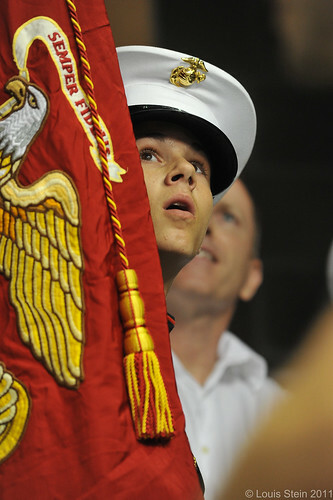 In th last second of the game, even the normally stoic Color Gaurd is on edge. 10:30pm and a quick switch of CF cards. Because it’s off to a local bar to meet some friends for, you know, a Drag Show. Like you do. I’m exhausted, but I’d never been to one of these before and figured it was high-time to get that particular Merit-Badge. Small, smoky bar; packed with people for the show. A Drag re-telling of biblical stories. Don’t exactly know how I’m going to explain this to my church-going mom; but I’ll worry about that later. Audience interaction - also, catching another photog's flash. Today I get fitted for a tux, becasue I'm also James Bond. Then it's off to my secret lair to get some F'n sleep.